When I use mariadb as multi-source slave DB I met a strange problem . Creating index on a vary large partition table , Mariadb do — copy to tmp table on the slave side. It takes a long time and still not finish over 9 hours. drop index command still has this problem. When I repeat these steps on MariaDB – 10.0.16 everything is OK.
Oracle Clusterware is portable cluster software that allows clustering of independent servers so that they cooperate as a single system. Oracle Clusterware was first released with Oracle Database 10g Release 1 as the required cluster technology for the Oracle multi-instance database, Oracle Real Application Clusters (RAC). Oracle Clusterware 12c Release 1 is the integrated foundation for Oracle Real Application Clusters (RAC) and the High Availability (HA) and resource management framework for all applications on any major platform. Oracle Clusterware 12c builds on the innovative technology introduced with Oracle Clusterware 11g by providing comprehensive multi-tiered HA and resource management for consolidated environments. The idea is to leverage Oracle Clusterware in the cloud to provide enterprise-class resiliency where required and dynamic, online allocation of compute resources where needed, when needed. MySQL has an extensive range of high-availability solutions to suit many different use cases and deployment needs. This list spans from the time-tested – yet continuously-improved – MySQL replication to the just-released MySQL Fabric, giving users many certified solutions for highly available MySQL deployments. The list is growing yet again, with Oracle Clusterware adding support for MySQL. Oracle’s Clusterware product is the foundation for the Oracle RAC, and has been battle-tested for high availability support for Oracle database, as well as other Oracle applications. This technology is now available as part of the MySQL Enterprise subscription, and – like all Oracle commercial products – is freely available for evaluation purposes. This post will explain Oracle Clusterware architecture and the benefits to MySQL users, and will be followed by a later post focusing on how to deploy Clusterware agents with MySQL. semisync work. We didn't like to run additional two dedicated slaves per master just for semisync. 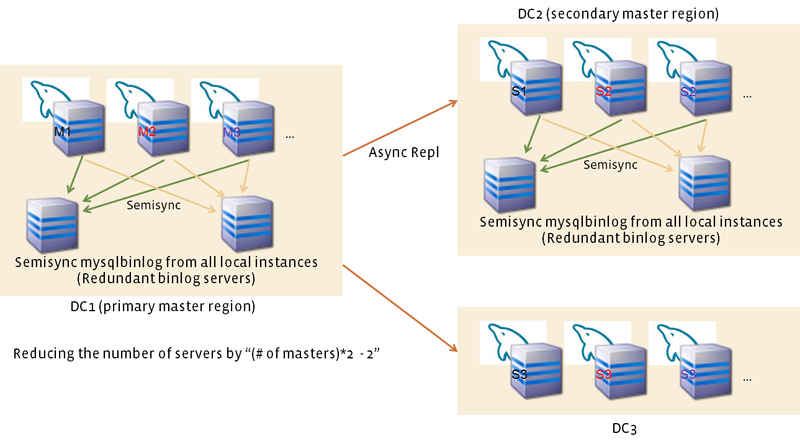 So we invented semisync mysqlbinlog and use it instead of semisync slaves, as shown in the below figure." Starting from MHA version 0.56, MHA supports new section [binlogN]. In binlog section, you can define mysqlbinlog streaming servers. When MHA does GTID based failover, MHA checks binlog servers, and if binlog servers are ahead of other slaves, MHA applies differential binlog events to the new master before recovery. When MHA does non-GTID based (traditional) failover, MHA ignores binlog servers. Below is an example configuration.